For the geological formation in Arizona, see Bell Rock (Arizona). The masonry work on which the lighthouse rests was constructed to such a high standard that it has not been replaced or adapted in 200 years. The lamps and reflectors were replaced in 1843 and used in the lighthouse at Cape Bonavista, Newfoundland, where they are currently on display. The working of the lighthouse has been automated since 1988. The lighthouse operated in tandem with a shore station, the Bell Rock Signal Tower, built in 1813 at the mouth of Arbroath harbour. Today this building houses the Signal Tower Museum, a visitor centre detailing the history of the lighthouse. According to legend, the rock is called Bell Rock because of a 14th-century attempt by the Abbot of Arbroath to install a warning bell on it. The bell lasted only one year before it was stolen by a Dutch pirate. This story is immortalised in "The Inchcape Rock", a poem by 19th-century poet Robert Southey. The rock was the scene of many shipwrecks as it lies just below the surface of the sea for all but a few hours at low tide. By the turn of the 18th century, it was estimated that the rocks were responsible for the wrecking of up to six ships every winter. 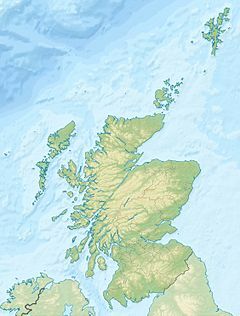 In one storm alone, seventy ships were lost off the east coast of Scotland. The Scottish engineer Robert Stevenson had proposed the construction of a lighthouse on Bell Rock in 1799, but cost concerns and the relatively radical nature of the proposal by a young engineer caused it to be shelved. The loss of the warship HMS York and all on board in 1804 resulted in a furore in Parliament. Stevenson sent his design to John Rennie who approved the design and costing. Rennie's reputation led to legislation being passed in 1806 enabling construction to begin. The Northern Lighthouse Board awarded the contract to design and build to John Rennie, with Stevenson being appointed as chief assistant. The design was based on the earlier Eddystone Lighthouse designed by John Smeaton, which Stevenson had inspected in 1801, and which was also built on an offshore reef using interlocking stones. It also contained newer features, such as rotating lights alternating between red and white designed by the carpenter Francis Watts. Stevenson was totally responsible for construction and his written account of the work gave little or no credit to Rennie. "The apportionment of responsibility for this work led to prolonged disputes between their respective descendants, but it is now certain that while Stevenson designed the lighthouse in the main, Rennie's role too was significant." Shows the lighthouse under construction including half of the temporary beacon that was constructed alongside to accommodate the workers and serve as a temporary lighthouse. In 1807 Stevenson hired 60 men, including a blacksmith so that the pick axes used to cut the foundations could be re-sharpened on site. Stevenson did not want to use black powder as it might have damaged the rock on which the lighthouse was to stand. They set sail on 17 August 1807, to be away for two months. While initially there was some reluctance about working on the Sabbath, in order to complete the lighthouse in time and on budget, the majority of the workers were prepared to work on Sundays, apart from four of the stonemasons who declined, but who later also worked on Sundays. For 20 hours each day, while the rock was covered by up to 12 feet (3.7 m) of water, the men lived on a ship moored 1 mile (2 km) off the rock. The first task was to build a beacon house on tall wooden struts, so the men would have a place to stay on the reef, instead of the time-consuming row to and from the ship each day and after an incident whereby one of the boats came adrift. The beacon house had places for 15 men. The foundations and beacon legs were raised during the first season. During the winter, work on the lighthouse was paused as stonemasons cut rocks for the lighthouse out of Aberdeen granite. During early 1808, work resumed. The beacon house barracks was completed and the first three courses of stone were laid. In the whole of the second season only 80 hours of building work took place on the rock. During this time, before the completion of the barracks, a young worker was knocked unconscious by a buoy ring and drowned. As he was the primary breadwinner for his family, Stevenson offered the now-vacant position to his younger brother Alexander Scott, who accepted. In September 1808 John Bonnyman, a stonemason, had to have a finger amputated following an accident with the beam crane on the Rock; as recompense for this mishap he was later appointed one of the first lighthouse keepers. Stevenson was frustrated by a visit from Rennie, in 1809, whom he saw as interfering with his work. As a strategy to ward off further visits, he wrote Rennie a total of 82 letters, asking detailed questions about a large range of construction issues (including what type of window putty and locks to use). Rennie replied in detail to every letter, but Stevenson largely ignored the replies. In June 1809 one of the principal builders, Michael Wishart, was caught beneath a crane when it collapsed, and his feet were severely injured, preventing him from working further on the project. He asked Stevenson if he could be appointed lighthouse keeper and he ultimately took up a position as assistant keeper in 1811. Work stopped on 22 August 1809, by which time a large part of the tower had been completed. In January 1810, Stevenson's twins died of whooping cough, and two weeks later his youngest daughter Janet also died of this disease. Rennie wrote Stevenson a consoling letter. During this final period of construction the lighthouse became something of a tourist attraction. Many people were anxious to see the completion of the tallest off-shore lighthouse in the world. In this final season, while the men were staying in the beacon house, a 7-hour storm struck. Worker Charles Henderson was lost, and his body was never found. Work was finally completed after having consumed about 2500 granite stones, all carried by one horse, Bassey. Ultimately, the project came in 50 per cent above the original estimate of £42,000 (2009: £2,490,000) budget. Since the construction of the lighthouse the only recorded shipwrecks have been that of HMS Argyll during wartime blackouts in 1915 and the Banff-registered cargo vessel Rosecraig that ran aground in fog on the evening of 21 September 1908, and sank. Her seven crew members were saved. The lighthouse on the rock had been ordered to switch its lights off during the First World War for fear of assisting German U-boats in their operations, and the light was only turned on by special permission. On 28 October 1915 while in view of the lighthouse, HMS Argyll under the command of Captain James Tancred sent a signal requesting the light to be turned on. The ship proceeded on its course believing the signal had been received, but it had not and the light was not switched on. Soon afterwards, Argyll ran aground, suffering extensive damage to much of the hull. Two destroyers – HMS Hornet and HMS Jackal – assisted in the rescue of her crew. Despite the damage, there were no fatalities among her crew. After all valuable items onboard had been salvaged, including her 6-inch (150 mm) guns, she was blown up by the naval salvage team. In 1970, her two large propellers were recovered by divers and sold for scrap. On 15 December 1955, RAF Bristol Sycamore helicopter XG501, crewed by Flight Sergeant P. A. Beart and Sergeant E. F. Hall, departed from RAF Leuchars at 09:35 to perform a sea-winching exercise at the Bell Rock lighthouse. At approximately 10:00, the helicopter's tail rotor struck the anemometer on the top of the lighthouse, and as a result the aircraft crashed into the sea. The incident was witnessed by the crew of a second helicopter that immediately transmitted a distress call and flew to the scene of the crash. In response to the distress signal, four aircraft, a further two Sycamore helicopters, an RAF rescue launch and three lifeboats searched the area, recovering the body of XG501's navigator; the body of the pilot was not recovered. The lighthouse was damaged, including the loss of its light, but its keepers were uninjured. Owing to bad weather, the lighthouse could not be repaired until after 20 December, when conditions permitted the delivery of supplies. R. M. Ballantyne's novel The Lighthouse (1865) is centred on the construction of the Bell Rock Lighthouse. ^ "Northern Lighthouse Board - Bell Rock". Northern Lighthouse Board. Retrieved 20 January 2019. ^ "Bell Rock Lighthouse". National Galleries: Collection. National Galleries of Scotland. Retrieved 18 January 2016. 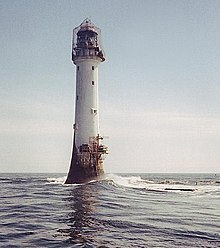 Wikimedia Commons has media related to Bell Rock Lighthouse. Christopher Spencer, Who Built the Bell Rock Lighthouse?, BBC, British history, Empire and Sea Power, 2003. This page was last edited on 20 January 2019, at 03:56 (UTC).